Hi Readers! I'm convinced that the greatest resource we have in the singing business is each other, because the vast and ever-growing network of generous colleagues who share their hard-won knowledge every chance they get gives us all a hand up the ladder. Today the BSR Blog is thrilled to present a guest post from our friend and colleague Sarah Whitten, an accomplished singer and yoga expert who is about to drop some seriously awesome practical advice that every singer with a correlating career (almost every singer, that is) NEEDS. How do we go from computer screen to concert hall? How do we protect our bodies and our voices and give ourselves the best chance to do our best work? Well, read on, and thank you, Sarah! Any singer with a day job will tell you it can be hard to go from sitting at a desk or on a piano bench all day to singing well in a rehearsal or performance. Your body is stiff from inactivity, the breath doesn’t flow as easily as it could, it takes longer to warm up the voice, and often the body just feels sluggish. Yet day jobs are a reality. While it is vital to be mindful of how much and how well you use your voice during the day, staying hydrated and well fed, you also need to pay attention to your physical form. When you truly embrace the idea that the whole body is your instrument, you can begin to identify places where you can make small physical changes during the day to make the transition from desk to stage happen more smoothly. Why can it be so hard to sing after being at work all day? Most of us know that muscles function best when they are well fed and well hydrated, but we also need to be moving them well. When we sit in the same chair all day every day, our body adapts, and in this case adaptation isn’t a good thing. Adaptation in our body looks like joints that no longer have the full range of motion. 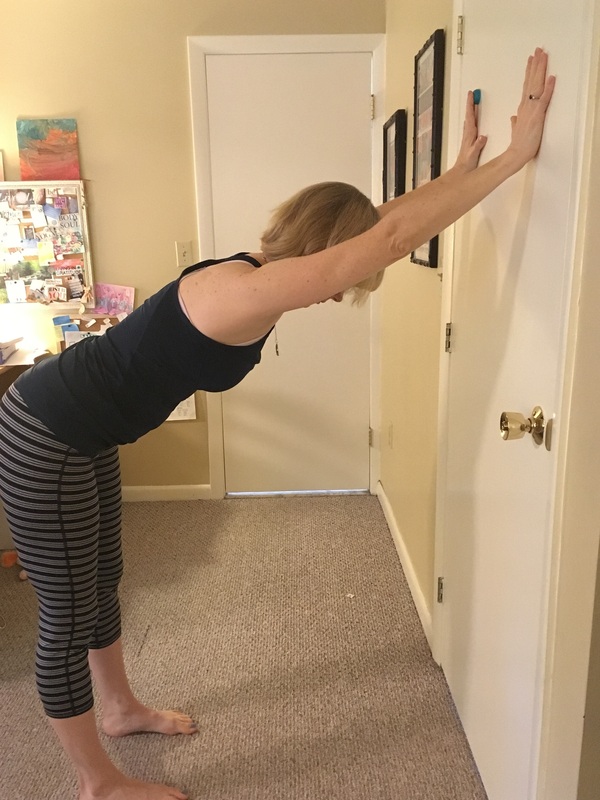 Those limited joints create small changes that show up as stiffness when we stand up from sitting, tight shoulders, poorly positioned pelvis, aching backs, jaw tension, knee and foot problems, and a weak core, and all of that contributes to having a voice that isn’t as easy to produce as you’d like. A lifetime of sitting (because let’s face it, when you started kindergarten at age 5, you began your career as a Professional Sitter) translates to a body that tends to roll back onto the pelvis when sitting. The extreme of this is sinking into a super cushy couch or chair or sliding down in your seat at the world’s most boring department meeting and the whole back of your body becomes a C shape. Even if you aren’t completely rounding the back, even a slight tuck of the pelvis trickles up the body creating excessive rounding and immobility in the thoracic spine, which we tend to mask by thrusting the ribs forward. Limitations in the thoracic spine mean your ribcage doesn’t have good three-dimensional motion when breathing. When you sit, you over-recruit the abdominals to stabilize the spine – work that actually should be done by the glutes, which in fact are weak from being sat on for a lifetime. When we sit the head tends to end up thrust out in front of the shoulders, the chin lifted, and the arms are often held out in front, palms down – think typing or texting or driving. Even if you aren’t working at an office job and you're waiting tables, you're likely to be assuming a relatively small number of positions in the body each day – for example, holding a serving tray or bending over to bus tables. The reality is we aren’t meant to be still anywhere near as much as we are in our modern lives. We are built to move. Movement is also a key element to breathing well. Our breath responds to the demands we place on the body. When we are largely still and unmoving, our breath is shallow, as we aren’t requiring more oxygen then that which will keep us alive. Making the transition from shallow, keeping-you-alive respiration that comes with being largely still all day, to the extreme kind of breathing that is known as singing, can be quite challenging. You may have heard about this from a voice teacher or coach who has commented that your breath energy is lacking, or perhaps you see this in a school age voice student who comes for a lesson after sitting all day at a desk. What can we do to better move the body and breath during the day? The most obvious solution is to sit as little as possible in your daily life. If you sit to get to work, sit at work, sit to go home from work and then sit on your couch, you definitely need to get up and move more. See if you can incorporate walking for some or all of your commute. Take regular breaks at work where you get up and move every 30 minutes either by walking around the office, going outside or climbing stairs. Create an active standing workstation. This can be done simply by flipping a box upside down on a desk or by purchasing a standing work station. The active part comes in by adding things like a rolled towel or half foam roller to do calf stretching on and a tennis ball to step and roll your feet, or even a cobblestone mat to stand on and keep your feet limber. Designate a portion of your lunch break for movement: walk first and eat after. When you have a rehearsal or performance after work, arrive early enough to walk briskly for 10-20 minutes. It’ll get your body and breath moving. Set aside 10-15 minutes during a break time to do some breath work, exploring ease, depth, pacing etc. If you work from home perhaps you can create a low workstation where you sit on the floor or a cushion and work at a coffee table. If the seat is bucketed (like in your car), fold a towel to fill in the bucket, bringing up the seat level. Sit forward in a chair so you can sit with a neutral pelvis. If your legs are long, sit forward and drop one knee toward the floor. If your legs are short, put a block or a small step stool under them. Use something like www.sitonthewedge.com to facilitate getting your pelvis in neutral. Sometimes when we begin trying to sit with a neutral pelvis, the tension in the backs of our legs make it painful in the lower back. A wedge helps relieve that while you work on releasing those tensions and building strength in your weak areas. If you want to sit on an exercise ball to help your core be active, be sure your hips are higher than your knees. Here are a few movements you can do at your desk to help your upper body. Incorporate these throughout the day. Stay in each pose for up to a minute at a time while focusing on keeping your breath easy and free. Sit or stand in alignment. Exhale and slide the chin back and up toward the ears. Do not allow the ribcage to thrust forward. Keep the ribs dropped. Place hands on wall above head. Back feet up, hinging from the hip joints, bringing thorax toward the ground. Don’t sway the back (as shown in the no picture). 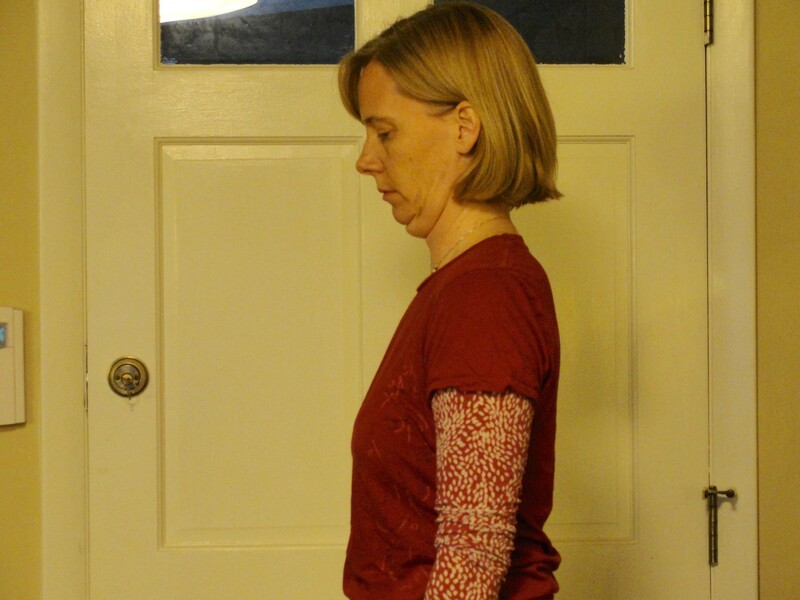 Keep the ribs in, as this won’t allow you to bypass your shoulder tension. 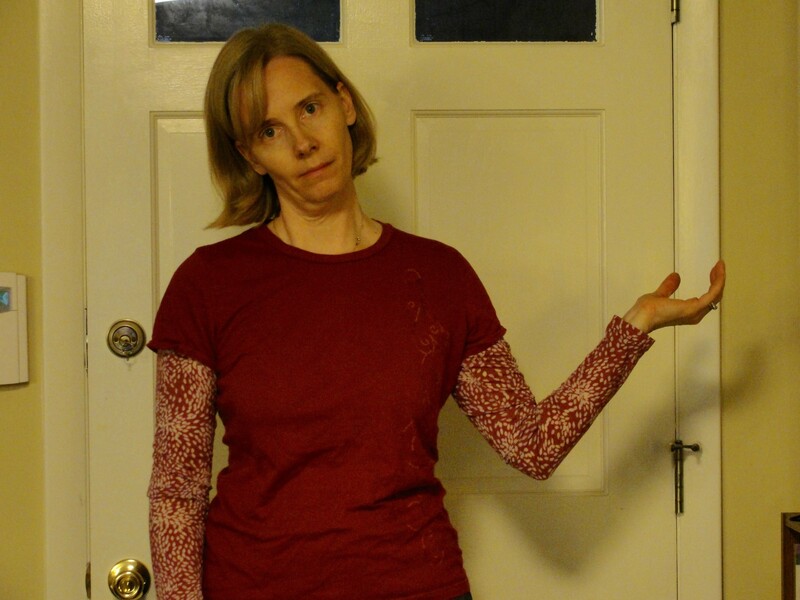 Bring one arm out to the side, elbow bent. Spin the hand back as though pouring out a glass of water. don’t allow the ribs to thrust forward. Slowly drop the opposite ear toward the opposite shoulder. Stay for up to a minute. Come out on an exhale, first slowly lowering the arm and then raising the head. 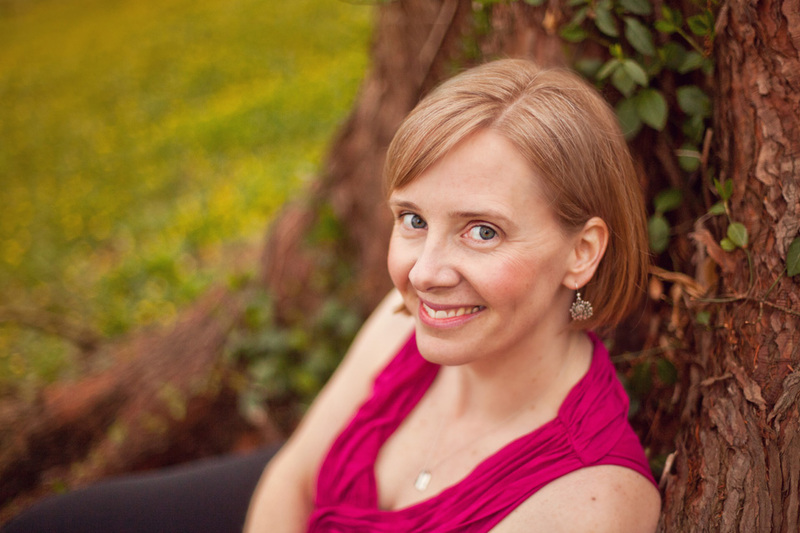 Sarah Whitten, MA, MM is a voice and yoga expert, focusing on whole body wellness and function. A 500-hour Certified Yoga Instructor, Sarah Whitten offers a fusion of traditional yoga and other movement modalities help singers resolve physical issues voices and find their optimal sound. She offers workshops and courses around the country and also online. To connect and learn more about her work, visit www.sarahwhitten.com.